12 year old Adam Morrissey vanished two years ago on his way home from school. Three months later, Jimmy Bennett went missing as well. This happened 75 miles away. Clothes were found at a prison mail room belonging to both of the boys. Both sets of clothing had blood stains on them. The clothing was being sent to convicted serial killer Antonia Slade. Antonia was convicted of killing children fifteen years ago. She and her boyfriend lived together. He shot himself when police caught up with them. Nine bodies of children - five girls and four boys - were found encased behind the drywall in their basement. All were shot in the head. Hotch and JJ interrogate Antonia in prison. She already knows about the bloody clothing, and knows that's why they're coming to interview her. Antonia agrees only to talk with one agent. Every time she does, she asks each one something about themselves. Hotch asks her a couple of questions. She says nothing, but instead writes something on a piece of paper, rolls it up and throws it at him. The note says "all work and no play makes Agent Hotchner a dull boy." It's written three times. Antonia tells JJ the clothing was sent by a zealous fan. She offers to give her more if she gets a transfer to a prison near her home. JJ tells her that's not possible. The lab examines the note she gave Hotch, and finds some imprints of other things Antonia has written. Reid believes it's a cypher, a secret message. Reid asks Antonia for the cypher key. She spits out her food on Reid's palm and writes the initials C++ in it, telling him it's the key. She tells him the boys are still alive. Garcia tells the team that Orel Wilbur - one of Antonia's guards - has been picking up extra shifts so he can be near her. Reid interviews Wilbur, who tells him Antonia has a lot of influence in prison. 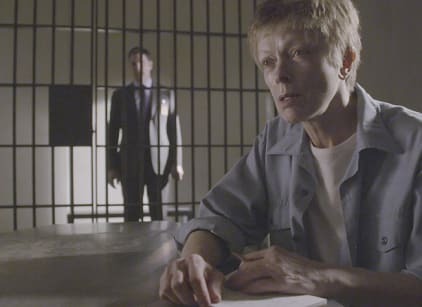 Reid theorizes that there's someone else in prison who Antonia has agreed to protect, as long as he keeps the mail communication going for her. Reid breaks the cypher code, and determines the letter says the two boys will be killed tonight, in five hours' time. The Unsub grabs the two boys and takes them somewhere. The BAU agrees to transfer Antonia to a prison near her home. Reid believes Antonia wants to go to where the Unsub (her cohort) is, so she can witness the murders of the two boys. Antonia tells Lewis the Unsub's bringing the boys to Kentucky. Garcia identifies the Unsub as Claude Barlow. Antonia agrees to take the team to Barlow, but not unless they undo her cuffs. Hotch authorizes it. The team pulls into the location to which Antonia lead them. They rescue one of the boys. The other one is missing - the Unsub has him. Antonia directs them down a path. They encounter Barlow, who is holding a gun to the boy's head. He says he won't let him go unless he sees Antonia. Antonia walks up to him, and whisper's something in his head. The boy goes free. Barlow shoots himself in the head. The team returns Antonia to her original prison. Hotch visits her one more time, and asks why she set the whole thing up. She agrees to tell him if he proves himself. Hotch tells her about a time when she was 14 years old, and got pregnant by the son of a neighbor. Her authoritarian father made her have the child at home. He then murdered her boyfriend. Hotch says when she was killing teenagers, she was killing herself or her boyfriend for not being disciplined. In return, Antonia tells Hotch there's a storm coming, and he's about to be swept away.